Quarries and pits are a temporary land use. 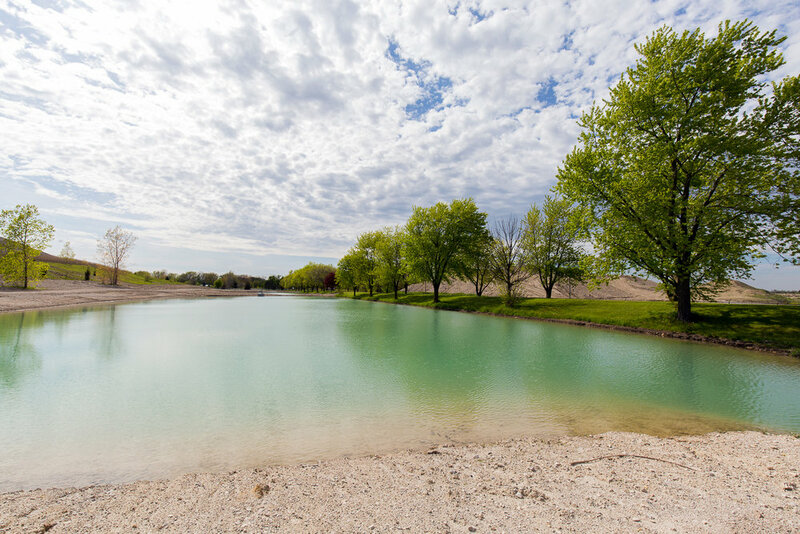 When aggregate extraction is completed in each section of a pit or quarry, the site is rehabilitated for one of a wide range of end uses: wildlife habitats, wetlands, recreational parks, forestry or agricultural lands. The rehabilitation is carefully planned: the land is shaped to support the end use and prevent erosion, and the original topsoil is replaced. Some of the best-known natural landmarks in Ontario used to be quarries or pits, including more than 70 rehabilitated sites within the city of Toronto alone. This section of the site highlights 12 of the 18 Bronze Plaque Award winners. The Bronze Plaque Award is given to those sites that demonstrate rehabilitation compatible with the surrounding landscape, outstanding site design & rehabilitation, and outstanding ongoing site management. Click here to view a sampling of rehabilitated quarries and pits. Why are most pits and quarries located near populated areas? Why can't they be relegated to sparsely populated lands in Northern Ontario, for example? Isn't aggregate plentiful in the north? The further away the aggregate source is from its end use, the greater the economic, environmental and social impact. Sixty percent of the cost of aggregate is transportation. As well, if every load of aggregate used in Ontario had to travel one extra kilometre to reach the jobsite, an extra 2.5 million litres of fossil fuel would be consumed annually, and annual greenhouse gas emissions would increase by 6,907 tonnes. It makes environmental and economic sense to locate quarries and pits close to where the aggregate will be used. We’re very fortunate to have abundant supplies of stone, sand and gravel in Ontario. Not just for the construction of roads and buildings, but for our health and the well-being of generations to come. In Third World countries, the absence of an aggregate industry has a direct impact on the health of the population. Our landscape, rich in natural aggregate resources, has allowed us to build superior sanitation and water purification systems. This has in turn led to the elimination of dangerous diseases such as cholera and typhoid fever. Without the abundant aggregate supplies that we’re lucky enough to be able to access in Ontario, building, maintaining and upgrading these essential systems to meet rising demand would be costly and prohibitive. Ontario has progressed from the disease-ridden, aggregate-poor place it was long ago. Today, skyscrapers soar, subways hum as cool, clean water trickles from taps in our fair, clean province. All of this, and more, is brought to you by the basic raw materials of sand and gravel. Aggregate operators are primarily water managers, and not water consumers. To understand how water is managed, it helps to understand that pits and quarries come in three major categories, and each uses water a bit differently. The first category, representing the majority of sites, is where sand, gravel and rocks are extracted from above the water table, so the operations do not reach far down enough to have any impact on the water table. With these operations, water is used to wash fine particles from the extracted gravel or stone, and then the water is recycled in a closed-loop system and used over and over again. Very little water is lost. The second category of sites is where sand and gravel is dredged from below the water table. In these types of operations the water stays where it is, only the sand and gravel is removed. Years of monitoring these operations have shown no impact to the water table. The third kind of operation is a rock quarry. In this case, the water may have to be pumped out of the quarry so that blasting and digging can be done safely. However, water is not consumed in the operation, but discharged onto the surrounding surface where it filters back into the ground or is sent to nearby rivers or lakes. Quarries that operate below the water table are required by law to mitigate impacts to nearby sensitive features such as wells, streams and wetlands. Once extraction is complete, these sites become lakes or new important wetlands. WHAT HAPPENS TO FORMER PITS AND QUARRIES? Progressive and final rehabilitation (turning former aggregate sites into new uses) is a legal requirement for producers of aggregate. What that means is that once the material from an active area of a site has been removed, producers must rehabilitate the site in accordance with the site plans that they submitted to receive their aggregate licence. And likewise, when the final section of the site has been extracted, the producer is required to complete any rehabilitation that remains. For examples of outstanding rehabilitation, visit our Bronze Plaque award winners! The aggregate industry is one of the cleanest, and most highly regulated industries in Ontario, to ensure the protection of people and the natural environment. The 25 pieces of legislation that protect the environment and future resources include regulations set out by the Ontario Ministry of the Environment and Climate Change, Ontario Endangered Species Act, the Greenbelt, Oakridges Moraine and Niagara Escarpment Plans as well as the Aggregate Resources Act. Often, producers will go beyond what is required by law to protect wildlife - such as creating buffer zones near sensitive natural resource areas, working closely with local conservation authorities on environmental management projects, and sponsoring environmental research and protection efforts. No chemicals are involved in the extraction or processing of aggregate materials. The topsoil, and other organic material removed from the rock surface before mining begins is not sent to a landfill or used for other landfill purposes, it is stored on-site and used in the rehabilitation of the pit or quarry site.